It would be so easy to use money to solve this problem, but we won't. Here's why. Sometimes all it takes to solve a problem, with the possibility of changing a child's life, is just a little bit of money. If you've got it, why not give it? But we want to be very clear about how God has called us to serve, as a discipleship movement. And not try to be all things to all people - or to try to solve every problem that a community faces. This is why we need the wider body of Christ. Not long ago, I was following a small group of Alongsiders and their little sisters on the backroads of a popular tourist city here in Cambodia. We walked along a dirt road, dodging sections flooded by a flurry of rain, and we came to a community of the working poor. Bourmey lives with her mother, grandmother, and two sisters. Her father divorced her mother and left the family three years ago, when Bourmey was ten. Bourmey's mother works at a hotel where she earns about $150 per month. Her older sister is also working, but her ailing grandmother can't work anymore. The five of them live on less than $2 per day each. That amount might be sufficient for rice farmers in the countryside, but they live in an urban tourist center with a higher cost of living and no way to raise their own food. Theary finished by stating, matter-of-factly, that soon Bourmey will have to drop out of school. The family simply can't afford the cost, and they would like her to go to work somehow. So there it was, the unspoken question: Can Alongsiders (as an organization) help Bourmey? This photo of Cambodian school children was posted online with a request for $10 donations to a respected organization in order to "send a child to school." It wouldn't take much to make a difference, just a few dollars (or a few kilograms of rice) every month to take the pressure off the family. That's all it would take for Bourmey to stay in school and on track for a better life. If only it were that simple. 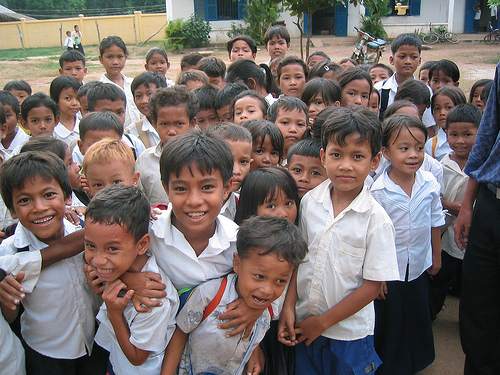 In the Alongsiders movement, many little brothers and sisters are among the poorest of the poor economically. Many of their lives seem to hang in the balance for lack of a few dollars a month. I've written here on the blog about Piya who is ashamed to attend school because she can't afford a uniform, and more recently about Saron, a compassionate Alongsider who feels like her future is in jeopardy if she can't get into a free nurse training program. Surely we could raise money for children and Alongsiders in need, and many people would gladly contribute. Why not? 1. The most important reason that we are cautious about bringing in outside funds is that many young people who serve as Alongsiders would no longer see any need to give from their own, seemingly meager, resources to support their little brothers and sisters. They would lose the opportunity to be generous and part of the solution, not to mention the chance to grow in faith (hint: think about what Jesus did with 5 barley loaves and 2 small fish). Generosity is an important aspect of discipleship that we want to nurture - but outside funds usually overpower rather than empower. 2. Future Alongsiders would be under pressure to pick relatives and friends as their little brothers and sisters, rather than being motivated primarily by love and choosing the most vulnerable children. It's simply expected, when you come from a family that is struggling with poverty themselves, that you share lucrative connections and opportunities with family and friends first. 3. The majority of little brothers and sisters come from very poor families, so many of them have clear and pressing needs. Once the word got out that Alongsiders was helping financially, the Alongsiders staff would be flooded with requests. And if requests were not met, or if some families received more than others, there would be jealousy and anger. To meet the requests fairly, each situation would have to be investigated, analyzed, and administrated. Soon Alongsiders as an organization would be running a centralized program based on distributing money. It would no longer be a grassroots discipleship movement with nearly unlimited growth potential. It's not hard to read the list above and agree with the reasoning in principle. Though the Alongsiders movement is having a widespread impact, it should still be clear that Alongsiders is not a "magic bullet" that solves every problem under the sun. We don't drill wells where there is a lack of water. We don't build houses or schools or factories. And we don't give school fees. There are many good NGO's who do those things - and together we make up the body of Christ. Still, it's another thing to face Bourmey knowing that the organization could help financially, but it won't. But understand the story doesn't end there. We must give credit for what people even in hard circumstances can do to help each other. And we need to have faith. In 2013, Alongsiders International worked with an independent research team to measure the impact that Cambodian Alongsiders were having in the lives of their little brothers and sisters. One of the most surprising findings was that 99 percent of the little brothers and sisters reported they were attending school. That was much higher than the percentage of their peers in the same communities attending school. It shows the power of the relationships that Alongsiders have with their little brothers and sisters and their families. Alongsiders is an exciting, growing movement that empowers people at the margins. It is raising up disciples of Jesus who act in love and faith. And they are making a significant impact on hundreds of children and families in Cambodia - and now in other countries, too. It may seem unsatisfying to not know how Bourmey's story will end. Often blog posts like this one finish on a happy note. Know this: Bourmey is well loved and her story is far from over. I want to end with a final word about money and how it's given. It's been said here before that many Alongsiders use their own money to help support their little brothers and sisters in amazing acts of faith and generosity. We have MUCH to learn from them. As I was writing this post, I heard the following story, and I want to finish with it. My little brother joined a soccer team and so he wanted to get a soccer uniform, but he didn't have enough money. I said that I would help him buy a uniform, but first he had to go to school, study hard, and rise to number one in his class. He has been going to school every day, and he has been studying hard. It's been nearly a year already, and he is almost number one in his class. I think he'll get the uniform soon. As you think about this very simple story, ask yourself: How much money is he talking about, and is it "a lot" or "a little"? What will be the results of giving it? What is his sense of urgency? What can you learn from this?